First, the IAAF last week suggested that Pistorius would be dangerous in a relay event, where the athletes are all bunched together at the change-over point. This would increase the risk of falling or clashing with another athlete. Athletes are often spiked in these ‘close contact’ situations, but of course the presence of carbon fibre blades poses a big risk for other athletes. The second grounds for Pistorius’ threat is that the IAAF have suggested that it is impossible for them to monitor and regulate the use of the prosthetics. The CAS decision, you’ll recall, was the Pistorius could compete IF he used the same prosthetics that were tested, first by the IAAF and this is team of scientists. The problem is, the IAAF testing cost 50,000 Euros, and I have it on good authority that Prof Herr, who led Pistorius’ case, says their defence cast cost $1 million, with hundreds of thousands going to the science part. Now, in the aftermath of the CAS decision, many people were saying exactly these two things. First, how on earth would the IAAF enforce the ruling without the possibility of “cheating” by bringing out new blades? Subtle changes, worth half a second here and there, are not beyond the realms of possibility. And many people were worried about this relay participation. The IAAF have merely expressed what everyone else is thinking or writing. And for this, Pistorius is threatening legal action (again). About two months ago, I did a post on Pistorius in which I made some arguments why the CAS decision was incorrect, and that the evidence presented by Herr and his team of scientists was flawed. I said at the time that evidence would emerge, the “truth” would gradually come out, and it would become apparent that what Pistorius did was bend the system. Effectively, he asked the right question, the unanswerable one, and now feels that he has been “cleared”. Let’s remember, that the absence of evidence is NOT the evidence of absence. The CAS made their ruling based on the flawed information presented to them, and legally, made the only decision they could. But time will reveal a more detailed analysis of that “evidence” and there will be flaws. And the first of those flaws is ENERGY-GENERATION. For this, I’ll do the post somewhat differently, using graphs to explain the physiology. So bear with me as we explain how Pistorius’ own testing suggests that he has an advantage. If you think back to January, the IAAF testing found that Pistorius used 25% less oxygen to run at 400m race pace than able-bodied runners. The graph below summarises this, and the conclusions drawn. The problem, which was freely admitted, is that the measurement of oxygen during sprinting, represents only part of the TOTAL energy. Energy comes from TWO SOURCES: Aerobic (using oxygen) and Anaerobic (without oxygen). Therefore, the conclusion drawn by the IAAF is only partly correct – it should say that he uses 25% less AEROBIC energy during 400m running. Pistorius and his group challenged the finding on these grounds, asking the question “What about the anaerobic component of 400m sprinting?”. We know from numerous studies that the split between the two is roughly 50-50, perhaps up to 60% for anaerobic sources. Now, this is A CRUCIAL POINT, but when you do a 200m race, about 70% of the energy is ANAEROBIC, and in a 400m race, it falls to 60%. It’s not possible to run a 400m race with much more anaerobic energy than this, because it means that too much energy is coming from anaerobic sources, and this is associated with fatigue, because of changes in ATP production, pH levels and lactate formation. FIRST: The carbon-fibre Cheetahs are designed by Ossur specifically for speed and sprinting. How can you assess them at slow speeds and then infer upwards? That test suffers from a problem of what is called external validity – it’s irrelevant to answer the actual question of Pistorius’ 400m race. SECOND: The RELATIVE proportion of the two energy systems must still be similar. 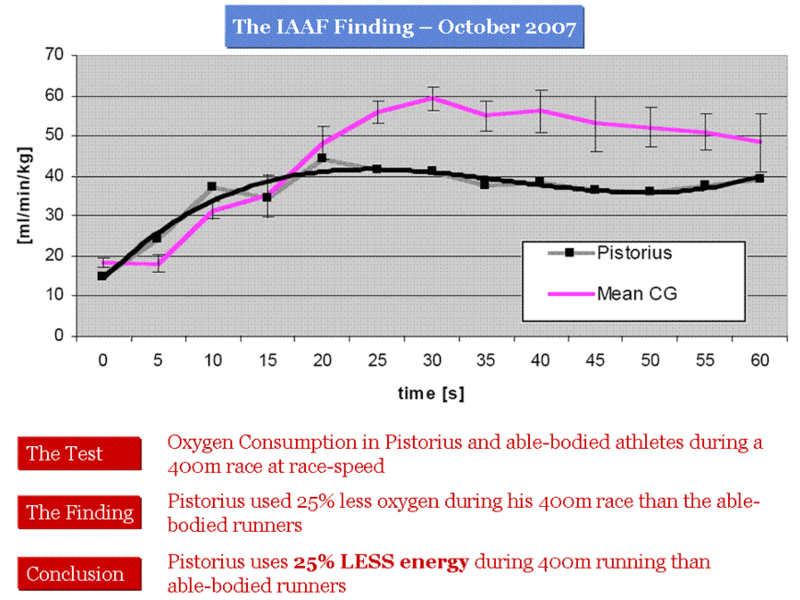 The IAAF finding suggests that Pistorius uses LESS aerobic energy. There is no reason to believe that he would not also use less anaerobic energy, because the two systems act in proportion. 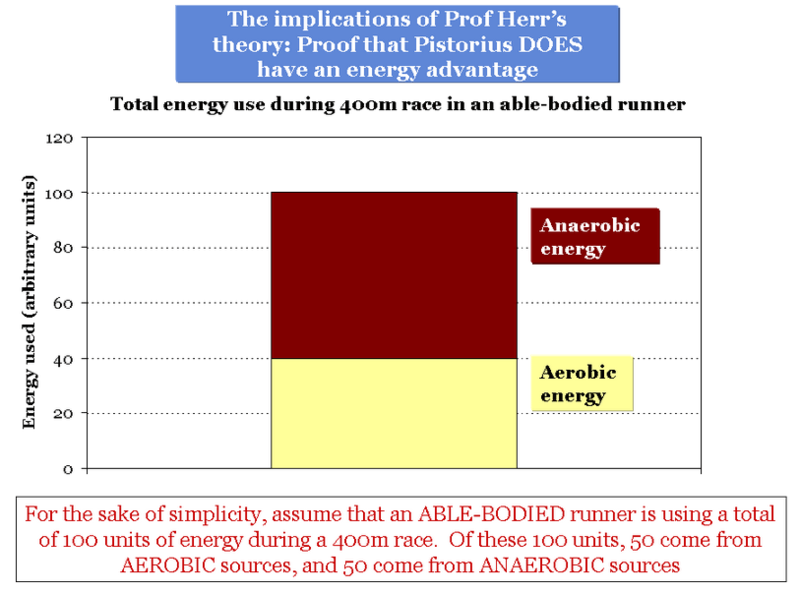 Unless of course, you believe the argument of Prof Herr, who is suggesting that Pistorius uses MORE anaerobic energy than anyone else. Note that they did not measure this, it’s a bald assertion, the kind they themselves criticize when others make it. It’s also incorrect, and physiologically impossible, as we’ll see shortly. The sequence of graphs below shows the problem with the Pistorius science. And then after that, the MILLION DOLLAR QUESTION that Pistorius cannot answer without suggesting his own advantage. Firstly, let’s take a typical able-bodied runner, who gets 40% of their energy aerobically, and 60% anaerobically. If we assume 100 units of energy, the graph above shows the breakdown. So, if we take the IAAF finding that he uses 25% less oxygen, then we see that he uses 30 units of aerobic energy. The Pistorius scientists contest this, and there are some theoretical arguments around measurement of oxygen during sprinting, but it has been done many times, and used in many studies, so this is not science-fiction, but validated science. Here, Pistorius uses the SAME TOTAL energy, which means MORE anaerobic energy must be used to bring his TOTAL up to 100 units – his ratio is 70 units ANAEROBIC, 30 units AEROBIC. Note that the numbers are arbitrary, but the point is that he uses upward of 15% more anaerobic energy to compensate for the reduced aerobic energy. Note also that there is no basis to suggest that this would ever happen. Herr and Weyand couldn’t tell you the reasons, and they only measured lactate levels to check this. They found similar lacate, which actually suggests that this would NOT happen, incidentally. Science does not know the exact reason, but it’s physiologically impossible to run 400m with this large an anaerobic energy contribution – theories range from pH changes to lactate accumulation to phosphate (or other metabolite) depletion. If this is true, Pistorius is effectively running a 400m race as though it is a 200m race, and should not be able to run more than 200m before he’d fatigue and be forced to slow down, unless…. He was immune to this fatigue, as a result of his carbon-fibre blades which do not experience the same fatigue as muscle. Therefore, Pistorius has an advantage. 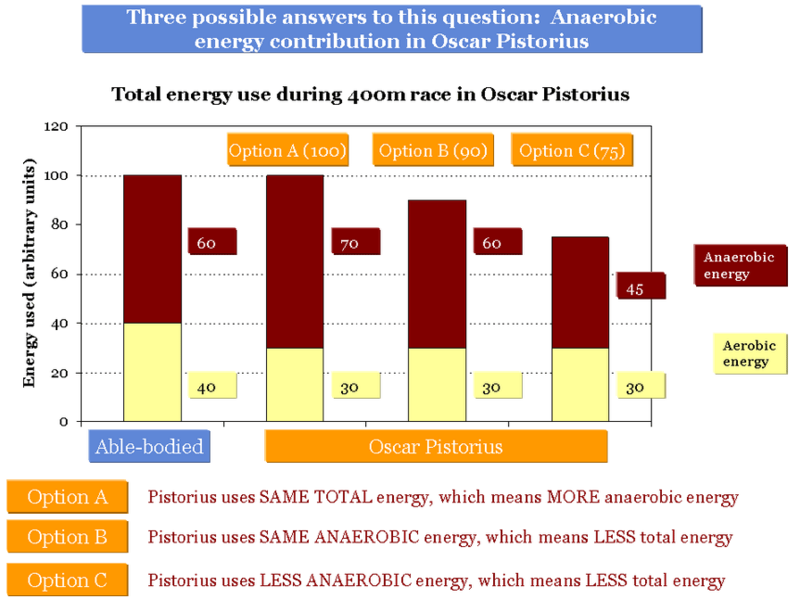 Pistorius uses the SAME ANAEROBIC energy, which means LESS total energy is used. His ratio is now 67% ANAEROBIC, 33% AEROBIC, but total anaerobic energy is the same. This means that Pistorius has an advantage because his total energy use is reduced. Why would it be lower? Because the carbon fibre blades provide energy returns that are FAR GREATER than in able-bodied runners, giving him this advantage. 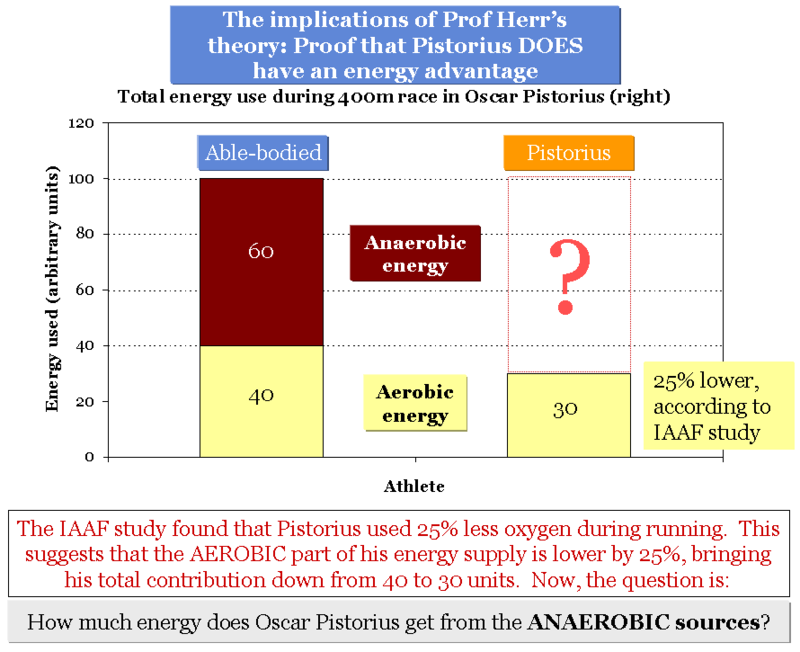 This is the most physiologically likely possibility, because here, Pistorius’ anaerobic energy contribution follows his aerobic contribution – both are lower. There is no physiological explanation for why Pistorius would use more anaerobic energy. Instead, the knowledge suggests that whatever is causing the aerobic energy to be lower will also reduce the anaerobic. Therefore, Pistorius’ total energy production is down considerably to run 400m. Pistorius has a substantial advantage, provided by the higher energy return of the blades, which means less demand to produce metabolic energy for muscle contraction. But the million dollar question, and the most telling finding so far, is yet to come. What is described above is that no matter how you look at it, it’s simply not possible to conclude that Pistorius does not enjoy a physiological and metabolic advantage during running at 400m speed. Either he is “unphysiological” as a result of higher anaerobic energy, or his total energy is lower. His own data suggest this. About a month ago, I was doing a radio interview on this and was suddenly struck by an epiphany, that Pistorius had in fact proven his advantage. Remember that when Herr and Weyand did their research on Pistorius, they made him run at slow speeds and measured his oxygen use. They found that at slow speeds, he used similar amounts of oxygen as the able-bodied runners to whom he was compared. But when the IAAF tested Pistorius at 400m race speeds, they found he used 25% LESS oxygen than able-bodied runners. At slow speeds, you have a runner who uses the same oxygen as able-bodied runners. So, how does a runner go from slow speeds to high speeds and not increase his use of oxygen like able-bodied runners do? The answer can only be that he is getting a mechanical advantage that allows him to run faster. He gets a mechanical advantage from the blades that the able-bodied runners don’t enjoy. They must produce more energy from metabolic sources, and hence increase their use of oxygen relative to Pistorius. That is, in a single question, the most telling evidence yet that an advantage exists. If you’ve been following the story, you’ll know that Pistorius has now missed the A-standard to qualify for the Olympic Games. But that’s not the end of it. There is still the relay, and the very real possibility that he’ll be picked despite not qualifying. The Olympic Games allows this, so there is nothing wrong with it from a legal perspective. However, it does mean that SA Olympics selectors will have to pick a guy based on projected times in Beijing, and overlook any number of athletes who have not qualified. Why would they do this? Well, because, according to Prof Hugh Herr, Oscar’s defence case cost $1 million. Remember that everyone is claiming that the legal and scientific work was done “pro bono”. That may well be true, but make no mistake, there is a massive army of sponsors and funders behind Pistorius. And now tell me, who spends $1 million to get an athlete cleared (you can buy freedom in the legal system, just not in science) and then doesn’t mind if he doesn’t run? So the commercial pressures on South Africa’s Olympic team (I’ll vouch for those as a SA local), plus the opportunity to gain exposure means Pistorius will, in my opinion, run in Beijing, confirming that the Olympic dream has a price. But the physiology doesn’t lie, the advantage exists. P.S. The purpose of this site is to stimulate discussion and debate, and obviously to provide insight on topical sports news. The Pistorius issue does all three. And therefore, I have no doubt someone will challenge part or all of the science in this post. That’s fine, but can I ask that if you do challenge the science, at the very least state a logical case rather than just pointing out “you’re wrong”, as has been done. I’m all for debate, but pro-Pistorius people (and his team) have shown little capacity for this in the past. I’ve had some excellent, thought-provoking correspondence from one or two neutrals, but they are few and far between. Indeed, one of the biggest problems in this whole case is that the IAAF science was released in January, giving Pistorius three months to criticize it and prepare a defence. To this day, the Pistorius science has not been fully released. When that’ science is eventually made available, it will be easy to pick apart, as I’ve done for only one aspect here. The problem then, is lack of debate and opportunity for discussion. The CAS verdict was based on unequal information and opportunity, because scrutiny of Pistorius’ science will reveal its flaws. So if I’m wrong, let me know why. And explain the results your way, rather than simply trashing the messenger.